Automotive business owners are always on the hunt for the flexibility and convenience to lift any vehicle. Best Buy Auto Equipment has the perfect solution for busy service centers, dealerships, and businesses that service a wide variety of cars, trucks, SUVs, and more. 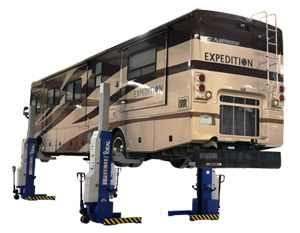 We offer a broad selection of mobile column car lifts at every price point. When working on heavy vehicles with long wheelbases, you will require a mobile column lifting system that is up to the task. Our selection features only the finest mobile lifting equipment made by manufacturers you know and trust. Browse our selection today to find BendPak®, Challenger™, and iDEAL™ mobile column lifts to suit your needs. Each column is capable of lifting 13,200 pounds. In a tandem of 2, that means 26,400 pound of lifting capacity. Max Distance Between Columns: 32'-8"
Each column is capable of lifting 18,000 pounds. In a tandem of 2, that means 36,000 pound of lifting capacity. Each column is capable of lifting 13,200 pounds. In a tandem of 4, that means 52,800 pound of lifting capacity. Each column is capable of lifting 18,000 pounds. In a tandem of 4, that means 72,000 pound of lifting capacity. Each column is capable of lifting 18,000 pounds. In a tandem of 4, that means 108,000 pound of lifting capacity. Car lifts are a vital component of any bustling garage, and we offer the variety you need to make the best decision for the efficiency and profitability of your business. 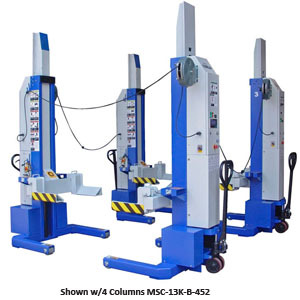 In tandems of two to six columns, our heavy-duty mobile column car lifts provide between 26,000 to 108,000 pounds of lifting potential. 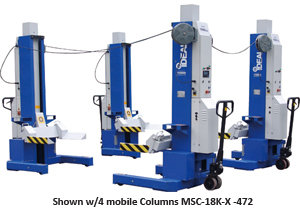 This selection includes mobile column lifts in sets of two to six, with an array of features that will streamline your service operations. iDEAL™ lifts come equipped with LCD screens, independent mechanical locking systems, and emergency switches for safety assurance. 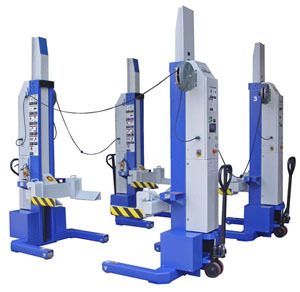 Portable lifts made by BendPak® feature limitless lift cycles, so you can work longer and enjoy the flexibility to work on a wider variety of vehicles, as well as the productivity‐enhancing tools to meet your needs. With a mobile column lifting system made by Challenger, you gain optional sets of accessory support stands that can accommodate multiple bays. These heavy-duty lifts feature robust yet easily maneuverable mobile columns that can be operated on almost any solid surface. Service technicians will benefit from integrated charging connections, touch screen control, wireless operation, and adjustable carriage assembly with up to five different positions that prevent movement between the tire and the carriage arms. Mobile column lifts will boost what your mechanics can do, and every system in our selection is engineered for ease of operation, safety, and the purpose of reducing operator fatigue. Best of all, we offer interest-free financing options on many of the models we offer. You can submit your business financing application today without any obligation. If you have any questions about our mobile column lifting system selection or need help, please contact us today to speak with a sales representative for additional information or further assistance.